A lot of people are looking at activating AirPrint on the new Snow Leopard 10.6.5… but it requires a tedious terminal session. So I followed a link from a tuaw.com post to the 3 files required and wrote a small wrapper around them to make the installation easier. The application is called AirPrintHacktivator and can be downloaded on this page. The application allow you to “Hacktivate” and “De Hacktivate” AirPrint by adding or removing the 3 files required… all of this while making a backup of the current files so they are properly restored during “De Hacktivation”. The application will attempt to detect if you have the right combination of OS and iTunes. WARNING! USE AT YOUR OWN RISK! It is working fine for me but don’t come crying if it break something on your Mac… mmmkay! UPDATE: Added iTunes 10.1 beta 2 to the requirement’s list and general fix-ups here and there. UPDATE 2: Added link to source of 3 files from original tuaw.com post in case one wonder. UPDATE 4: iTunes 10.1 still need hacktivation for AirPrint to work. Updated requirement section to list 10.1 final as needed product. UPDATE 5: Updated link to application to point to new and improved version and cleaned up the AppleScript portion. This is amazing. Sir, you truly rock. May luck shine on you. Thank you so much! It just works after adding the WiFi Printer again and turning Print Sharing on. Please continue to update AirPrint Hacktivator. Can I use this if I’d like to print from my iPad to a non-wifi enabled printer that is connected via USB to my MacBook (which does have wifi/airport capabilities)? Absolutely, this is what it is for! Works great! Many thanks, much appreciated. Simple slide the switch to OFF, remove and then add the printer you shared. It should no longer show on the iOS 4.2.1+ devices. 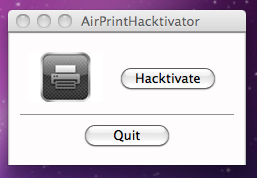 You can then safely delete the AirPrint Hacktivator application. Awesome! Works great! Many thanks! Worked great. Just needed to delete and add the printer. I love hacks like this! Works flawlessly, Thank you so much for your time and effort. Works great. Just as advertised. Now explain to me why on earth this is necessary. Why didn’t Apple make it “just work.” Why was AirPrint born crippled?? Installed activator software on my Mac running 10.6.5, deleted and reinstalled and ‘shared’ my network printer. iPad is still showing ‘No Printers Found’. When I close Macbook I can’t print any more but when is open everything is OK, why? available as they are share by your Mac. Pingback:	[4 - 4.2] Jak "odnaleźć" drukarkę w 4G ? will this work on Snow Leopard 10.6.6? Yes. Also working with 10.6.7 beta. I notice you refer to the printer as wifi. I have an HP Color Laserjet 3600N hooked up to my Airport Extreme using Ethernet cable. Will this Hack work for my printer as long as I have my mac up and running on the network, via Airport wifi? My printer is shared within my local network. Thanks in advance for any input from you. You will have to share the printer via your mac for it to be visible. I had to reboot my iPhone, but it worked afterward. Great job. I purchased an Epson NX420 with my MacBook. As others must have been before me, I was disappointed to say the least that it did not support “Airprint”. I guess I just assumed that if Apple was pushing the product it would “Airprint”. Downloaded your gizmo and I had a hot copy in my hand printed from my Ipad in about 30 seconds mmmkay. Well done! Hello when I go to download my iPad says, safari will not download or support this app!! Could you please help!! AirPrint is an application that actually run on a Mac. It is not intended for the iPad… But will allow the iPad to print to a printer attached to your Mac. I hope this help clear things up. I dont have a Mac, is there a program for windows that you know of? struggled at first. HP office jet ether cabled to the wireless router. Finally rebooted my iPad IOS 5 and works like a champ. On the iPhone 4 with IOS 5 it doesn’t even see the printer even after reboot. Any ideas? May sound silly but make sure the iPhone is connected over wifi to your network… Happened to be before to forget to connect to the right wifi ssid. Works fine from my MacBook Pro, but my iPad still can’t detect any AirPrint printers. Do I need to download anything to my iPad or should it just see the printer once I got it working on the MacBook? Great hack btw! Make sure your iPad/iPhone is connected via WiFi to the same network as your Mac. The printers should then be visible in the list when you try to print. Than you for your great APP!